En este estudio se ha realizado la simulación de crecidas y el mapeo de inundaciones en un tramo de 10 km del río Burgay usando el modelo hidráulico unidimensional HEC-RAS. El análisis de los resultados muestra que el modelo es capaz de simular los eventos de crecidas e inundaciones en ríos de la región interandina, a pesar de la escasa información disponible. Los gobiernos locales (p.e. municipios) pueden utilizar los mapas de zonificación de peligro de inundación para realizar una planificación y manejo sustentable de las llanuras aluviales, mediante medidas estructurales y/o no-estructurales (p.e. ordenanzas de uso del suelo) que consideren las características físicas de las márgenes del río. Apel, H., G.T. Aronica, H. Kreibich, A.H. Thieken, 2009. Flood risk analysis - how detailed do we need to be? Nat. Hazards, 49, 79-98. Bedient, P.B., W.C. Huber, B.E. Vieux, 2012. Hydrology and floodplain analysis. 5th edition, Pearson Education, 801 pp. Casas, A., G. Benito, V.R. Thorndycraft, M. Rico, 2006, The topographic data source of digital terrain models as a key element in the accuracy of hydraulic flood modeling. Earth Surf. Process. Landforms, 31, 444-456. CG Paute, 2008. Aplicaciones de la información temática digital de la Cuenca del Río Paute. CG Paute, Ecuador, DVD-ROM. Chow, Ven Te, 1959. Open channel hydraulics. 1st edition. McGraw-Hill, New York, 500 pp. Cunha, L.K., W.F. Krajewski, R. Mantilla, L. Cunha, 2011. A framework for flood risk assessment under nonstationary conditions or in the absence of historical data. J. Flood Risk Manage., 4, 3-22. Di Baldassarre, G., G. Schumann, P.D. Bates, J.E. Freer, K.J. Beven, 2010. Flood-plain mapping: a critical discussion of deterministic and probabilistic approaches. Hydrol. Sci. J., 55(3), 364-376. Di Baldassarre, G., S. Uhlenbrook, 2012. Is the current flood data enough? A treatise on research needs for the improvement of flood modelling. Hydrol. Process., 26, 153-158. Douben, K., 2006. Characteristis of river floods and flooding: a global overview, 1985-2003. Irrig. & Drain., 55, S9-S21. Dawei, H., 2011. Flood risk assessment and management. Bentham Science Publishers, 158 pp. Erwann M-K., K. Howard, 2011. Redesigning flood insurance, Science, 333, 408-409. Estrella, R., V. Tobar, 1994. 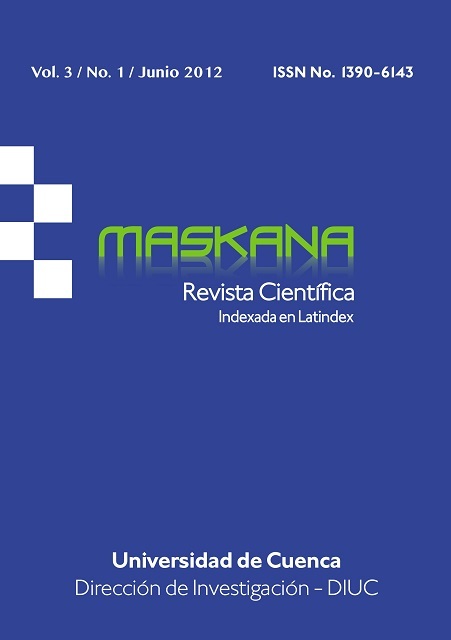 Actualización de los estudios hidrológicos, Tomo II: Hidrología, Planes Maestros de Agua Potable y Alcantarillado del Área Metropolitana de la Ciudad de Cuenca, ETAPA, Cuenca, Ecuador. Farahi, G., S.R. Khodashenas, B. Ghahraman, K. Esmaeeli, 2009. Flood inundation extent in storage cell mode. Sci. China Ser. E-Tech. Sci., 52(11), 3376-3381. FEMA, 2009. NFIP Floodplain management guidebook. 5th edition. FEMA - Region 10, Washington, 63 pp. FEMA, 2012. Numerical models meeting the minimum requirement of NFIP. http://www.fema.gov/plan/prevent/fhm/en_hydra.shtm el 25 junio de 2012. Feyen, L., R. Dankers, K. Bódis , P. Salomon, J.I. Barredo, 2011. Flood risk in Europe in present and future climates. Climate Change, DOI 10.1007/s10584-011-0339-7. Fleming, G., 2002. How can we learn to live with rivers? The findings of the Institution of Civil Engineers Presidential Commission on Food-risk management. Phil. Trans. R. Soc. London A, 360, 1527-1530. Gilles, D., N. Young, H., Schroeder, J. Piotrowski, Y. Chang, 2012. Inundation mapping initiatives of the Iowa Flood Center: statewide coverage and detailed urban flooding analysis. Water, 4, 85-106. Haestad Methods (Gary Dyhouse, Jennifer Hatchett, Jeremy Benn), 2007. Floodplain modeling using HEC-RAS. Haestad Press, Waterbury, CT USA, 658 pp. Heintz, M.D., M. Hagemeier-Klose, K. Wagner, 2012. Towards a risk governance culture in flood police-findings from the implementation of the “Floods Directive” in Germany. Water, 4, 135-156. Kron, W., 2002. Keynote lecture: Flood risk = hazard x exposure x vulnerability, Flood defense ’2002. In: Wu et al. (Eds. ), Science Press Ltd., New York, ISBN 1-880132-54-0, 82-97. Kundzewicz, Z.W., 2002. Non-structural flood protection and sustainability. Water Int., 27(1), 3-13. Lung, J.R., 2012. Flood management in California, Water, 4, 157-159. Mosquera-Machado, S., S. Ahmad, 2007. Flood hazard assessment of Atrato river in Colombia. Water Resour. Manage., 21, 591-609. Nott, J., 2006. Extreme events: A physical reconstruction and risk assessment. Cambridge University Press, New York, 297 pp. Ohl, C., S. Tapsell, 2000. Flooding and human health: the dangers posed are not always obvious. Brit. Med. J., 321, 1167-1168. Pender, G., S. Néelz, 2007. Use of computer model of flood inundation to facilitate communication in flood risk management. Environ. Hazard, 7, 106-114. Pinter, N., 2005. One step forward, two steps back on US floodplains. Sci. Mag., 308, 207-208. Robson, A.J., 2002. Evidence for trends in UK flooding. Phil. Trans. R. Soc. London A, 1327-1343. Samuels, P., F. Klijn, J. Dijkman, 2006. An analysis of the current practice of policies on river flood risk management in different countries. Irrig. & Drain., 55, S141-S150. Simonsson, L., A. Gerger Swartling, K. André, O. Wallgren, R.J.T. Klein, 2011. Chapter 23, Perceptions of Risk and Limits to Climate Change Adaptation: Case Studies of Two Swedish Urban Regions. In: Ford, J.D., L. Berrang-Ford (Eds. ), Climate Change Adaptation in Developed Nations: From Theory to Practice. Adv. Global Change Res., 42, 321-334. Smemoe, C.M., E.J. Nelson, A.K. Zundel, A.W. Miller, 2007. Demonstrating floodplain uncertainty using flood probability maps. J. Am. Water Resour. As., 43(2), 359-371. Stoica, A.E., I. Iancu, 2010. Flood vulnerability assessment based on mathematical modeling. Sci. J. Math. Model. Civil Engin., 5, 265-272. Sun, D., D. Zhang, X. Cheng, 2012. Framework of national non-structural measures for flash flood disaster prevention in China. Water, 4(1), 272-282. Tingsanchali, T., F. Karim, 2010. Flood hazard assessment and risk-based zoning of a tropical flood plain: case study of the Yom River, Thailand. Hydrol. Sci. J., 55(2), 145-161. Timbe, L., 2007. River flooding analysis using quasi-2D hydraulic modelling and geospatial data. PhD-Thesis, ISBN 978-90-5682-848-6, KU Leuven, Bélgica, 276 pp. Timbe, L., P. Willems, 2011. Desempeño de modelos hidráulicos 1D y 2D para la simulación de inundaciones. MASKANA, 2(1), 91-98. US-ACE, 2008, HEC-RAS: River Analysis System. Hydraulic Reference Manual-Version 4.0. U.S. Army Corps of Engin., 411 pp. US-ACE, 2006. HEC-GeoRAS: GIS tools for support of HEC-RAS using ArcGIS. User Manual- Version 4.1.1. U.S. Army Corps of Engin., 154 pp. Vojinovic Z., S.D. Seyoum, J.M. Mwalwaka, R.K. Price, 2011. Effects of model schematization, geometry and parameter values on urban flood modeling. Water Sci. Technol., 63(3), 462-467.